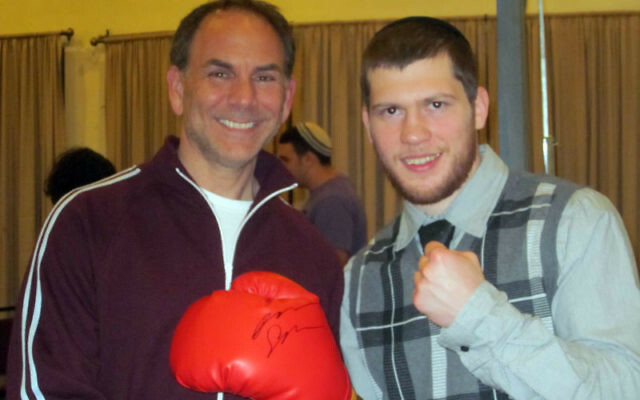 Champion boxer Dmitriy Salita, right, with Jeff Strumeier of Marc Ecko Enterprises at the May 4 event at Chabad of Western Monmouth County in Manalapan. Twenty minutes before his first televised boxing match, Dmitriy Salita had an urgent matter to attend to. Much to the consternation of his trainer, Salita refused to leave his Las Vegas hotel room until he had performed Havdala, the ritual ceremony marking the end of Shabbat. 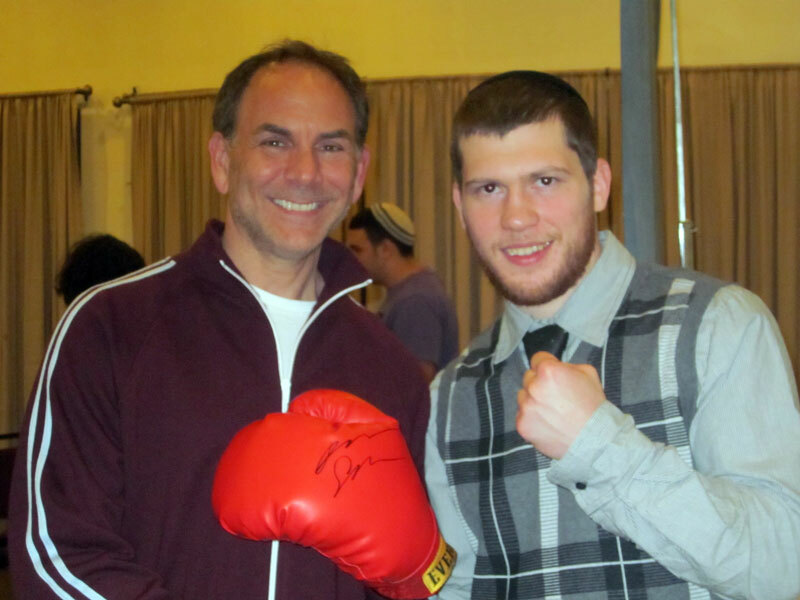 On May 4, Salita spoke to an audience of over 100 people at the Chabad of Western Monmouth County in Manalapan about his journey from Ukraine to the United States, the blossoming of his boxing career, and his identity as an American and a Jew. Salita moved with his family from Odessa, Ukraine, to New York City in 1991, when he was nine years old. He began boxing four years later. Known in the ring as the “Star of David” and now a welterweight champion, Salita boasts a 31-1-1 professional record, a Golden Gloves championship, and a Sugar Ray Robinson Award. He began to explore his Jewish roots during his mother’s battle with breast cancer in 1996 (she died in 1999). Salita first decided he would not fight on Shabbat at the 2000 U.S. championships in Gulfport, Miss. When Salita announced he wouldn’t fight on Shabbat, the boxing association told him he would be disqualified. A reporter intervened, and officials agreed to delay his fight until after sundown. “Thank God I won,” Salita said. “It was my personal sign from above that I made the right choice. Salita’s appearance in Manalapan was sponsored by Jeff Strumeier of Marlboro, whose apparel company, Marc Ecko Enterprises, has sponsored some of Salita’s fights.